That’s a lovely app, but it doesn’t exactly do much. In fact, the only thing that’s not hard-coded is the pin. So let’s dive in and change that! This week, we’ll be setting up all of our outlets to use data from Realm. This means we’ll also be making more data models, which will perfectly situate us to connect to the Realm Object Server next week! As I said before, a stop is just somewhere that Santa will be, and when he’ll be there. Santa keeps a very tight schedule of course, and is never late or early. He’s had hundreds of years to get this down to a science, so we can trust that if our data says he’ll be somewhere, he will be. We reuse the Location class from last week, and add a Date to it to mark the time. Note that we can use the new Swift 3 Foundation classes! Then we have convenience initializer, which I forgot to talk about last week. Per the docs, custom initializers on our Realm objects must be marked convenience and call self.init() (not super, like you might otherwise do) before doing anything else, due to Swift’s more limited introspection capabilities. We’ll worry about the algorithm that determines arrival time later, but trust me, it’s cool! And I’m not just saying that because I wrote it. 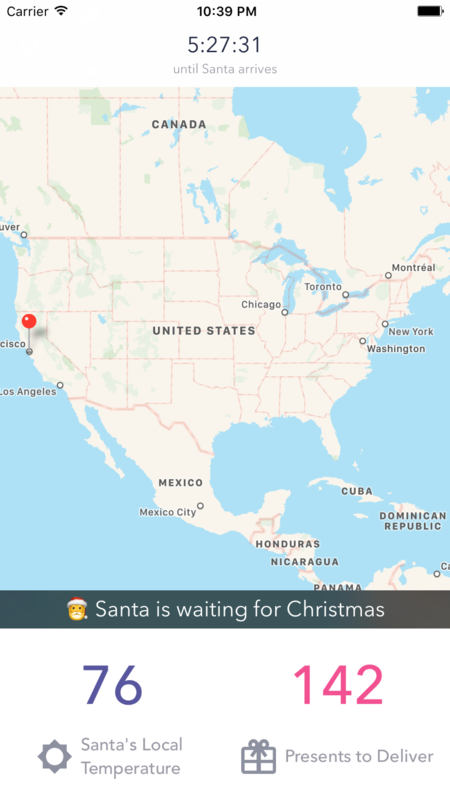 You can see at the bottom of the map that we can report on what Santa’s up to at the moment you open the app. Maybe he’s flying around, or delivering presents, or even talking to Mrs. Claus! Now I don’t know about you, but that sounds like a Swift enum to me. Unfortunately, those can’t be directly represented in Realm. But fortunately they can be represented by their raw values! As you can see, this enum is backed by Ints, which are representable in Realm. We could also have used Strings, but Ints are smaller and we’ll only be using the enum anyway. I assign the first case to 0, just to make double sure that the values are known (the Swift compiler will make each successive case 1 greater if you don’t give them explicit values). This makes it easy to share this data model with other platforms, since we can all agree on the meanings of the numbers. return "❔ We're not sure what Santa's up to right now…"
return "📞 Santa is talking to Mrs. Claus on the phone!" return "🎁 Santa is delivering presents right now!" return "🍪 Santa is having a snack of milk and cookies." return "🚀 Santa is flying to the next house." return "𐂂 Santa is taking care of his reindeer." In a real app, these should be localized, but your humble author only speaks English fluently. 😓 You can of course translate them, or really edit them however you like. Make these say whatever you want! Our public API is what Swift developers would expect: a property called activity of type Activity, which is an enum. In order to save that with Realm (and sync it later on), we have to back that with something Realm can save, so we pick an Int, since that’s the type we picked to back our enum with. So we have a private variable called _activity, and the public enum basically forwards to it. Now we have a Realm object with an enum property! This one is special, because we’ll be using it to learn how to work with the Realm Object Server. For now, we won’t worry about it, and we’ll circle back to it in a later week. This is by far the most straightforward property. It’s just an Int! Make sure it’s dynamic of course, but other than that, this is much simpler. You can pick whatever test data you like! Just something to make sure your UI updates later. Make sure your models compile by running your app. Because we changed a lot about the data models, Realm should throw an exception that says you need to migrate. Just delete the app from your simulator (the same way you’d delete it on a device, click and hold) and run your app again. The UI won’t be any different since we haven’t written that code yet, but just running the app successfully means that Realm has validated your new models and likes them. 2. Drive the UI with Realm data. Last week, we made the app drop the pin based on Santa’s location when the app launched. This week, we’re going to augment that in two ways: We’re going to add in more outlets, and we’re going to make the UI react to data changes. First, we forward this message to the map manager we wrote last week, so it can update the map. Then we put the activity and the presents remaining in their labels. Like last time, this update(with:) can be called off the main thread, which means these UIKit calls will blow up. 💥 Same solution as last time: Explicitly dispatch to the main thread. We’ll handle the arrival time next week, when we can get Santa’s route from the server, and the weather the week after, when we learn about the Realm Object Server in more depth. For now, this will be enough! This wrapper does a few things that make it simpler to use. First, it removes some extra parameters from the regular KVO function that we won’t use anyway. Second, it automatically signs up the observer for all properties, and uses the private versions that we know support KVO. As a bonus, it uses the new #keyPath keyword, which lets the compiler check the paths so we know we didn’t mistype them. Third, it brings route observation into the same code path by redirecting Realm collection notifications into KVO notifications. // There used to be a call to mapManager in here, but not any more! All we changed here is that we’re not going to call update(with:) on the map manager any more; we’ll let our reactive change handler do that. So we have our observation set up, and we remember to take it down when we’re done. But…where is our change handler? We should probably write that. Below viewDidLoad(), add a new function: the KVO listener. Thankfully, we’re using KVO in a very simple way, so we don’t have to worry about most of the parameters. All we do is make sure that we’re dealing with an update from a Santa (better safe than sorry). If we are, we feed it into update(with:) and update our UI. If we’re not, we pass the notification up the chain to super, per Apple’s docs. Alright, now run your app! You should see the UI change with your test data. If so, congratulations! Your data models are done, and your UI is reactive to your data changing. Your app is now ready for next week, when we’ll connect to the Realm Object Server. The nice part about the way the whole system was designed is that you really won’t have to change very much code at all. With the reactive setup we just built, changes from the server will generate the same notifications as local changes, so we won’t have to worry about handling incoming data in a special way.